Minigarden was born to bring greens back into our lives. Urban life has removed us from the pleasures of the land. We live surrounded by concrete, and contact with natural things is being relegated to the occasional weekend. There is little space, little time and the conveniences of cities make us forget that we are intimately connected with plants and we need them to live well. Minigarden is bringing back the green into our lives. Combining centuries-old knowledge passed down from parents to children over many generations and cutting-edge design processes, we have developed products conceived to turn anyone into an aficionado of gardening and small urban kitchen gardens at home,school and the office. Thanks to an easy and convenient plant irrigation system, and nutrition and care solutions, Minigarden systems enable the creation of vertical, corner, horizontal or mixed domestic green spaces of any desired size. Minigarden is ideal for creating a fun family dynamic through rediscovering the pleasure of living in close contact with nature. With Minigarden it’s easy to grow decorative and aromatic plants, as well as other vegetables, in any kind of space where agricultural land is not available. Easy to re-use. Mobile and durable. There are 4 models are available: Minigarden Basic, Minigarden Vertical, Minigarden Corner and Minigarden One. For multiple design options, Minigarden Vertical, Minigarden Corner and Minigarden One may be installed separately or together. 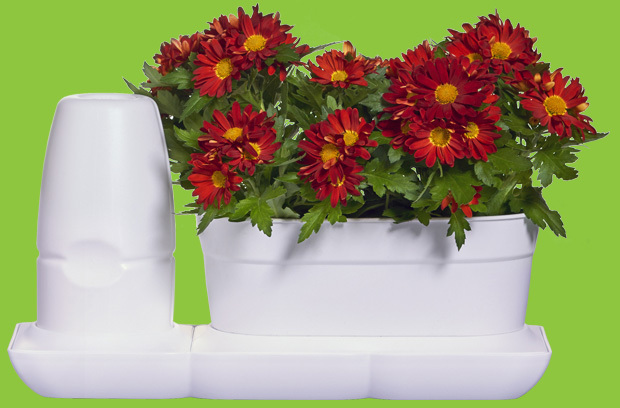 Minigarden Basic is a new solution for people less used to taking care of plants. It introduces the pleasures of having plants without the need to do a lot of work. We are constantly researching and developing. The Minigarden product range will soon be expanded with new models and products, increasing the number of solutions and the ease of urban cultivation. To increase design options, pair Minigarden Corner with Minigarden Vertical , although it’s also perfect on it’s own. It’s also perfect on it’s own. Minigarden Corner adds numerous new dimensions to Minigarden Vertical’s modularity. Your small vertical flower or vegetable garden. Ideal for small, confined spaces. Very easy installation and no technical knowledge required. Minigarden Basic is the perfect plant growing system for gardening newcomers or enthusiasts who don’t have much time to take care of plants.